This Dynasty Rookie ADP data is drawn from Rookie Only dynasty mock drafts run on MFL and organized by Ryan McDowell @RyanMc23. These rookie mock drafts are not run year-round. They are only operated a few months every year. Once live rookie drafts begin occuring on MFL, the MFL Rookie ADP data will be used in place of the DLF Mock Draft ADP data. Gain Instant Access to ALL of our ADP data and much more! 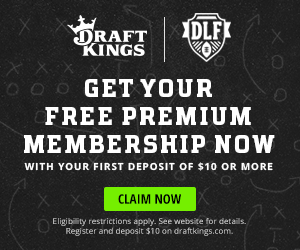 Try DLF Premium for only $5 with a Monthly Membership. Our dynasty rankings also include industry-leading features to help you with your research.